Acacia collagen and vegetal oils nourish and protect hair without weighing it down. Leaves hair soft, shiny and delicately scented. This conditioning mask is simply amazing. Truly. I have long, fine hair that was suffering from winter dryness, with only one use the texture of my hair has quite literally transformed. I am 60 years old and have many, many years of using high quality products that do ‘something’ and, until two days ago, I had never used a product that so simply evinced the exact benefits presented in its claims. I don’t write reviews, yet here I am. Amazed. This is a conditioner which I saw immediate effect and a noticeable difference compared to other conditioners. It does not weigh my hair down, made my damaged hair look like commercial hair, and smells amazing. At first I was a little skeptical about the smell when I was in the shower, but after drying my hair, the end note of the scent is amazing. I get compliments every time I use it! This has to be one of my favorite products from this line, the smell of jasmine is so luxurious and it leaves my hair nice and moisturized. I use Masque Fleurs de Jasmin as a conditioner, (after shampooing with Shampoo au miel) on my fine, limp wavy hair and it has worked wonders. It doesn’t weigh down my hair, lets it keep its bounce without the frizz and smells divine. Smells divine and leaves hair feeling like soft spun silk. Amazing product. Little pricey, but great results. I am a new customer for life. I am very happy with the results of this conditioning product. I use it once a week with wonderful results. Often times on the days I have used this my friends will ask if I have just had my hair cut as it looks so nice. I wouldn’t live without this masque. Okay, that sounds dramatique, but it’s true. Firstly i live in a dry, no humidity climate and winter weather means everything, including my hair suffers. I use this masque in the shower in lieu of conditioner. and it’s heaven. It smells like springtime, and my hair glistens, glows and has no static electricity! this is the best masque I ever had for my hair. It makes my hair looks voluminous. It moisturized hair perfectly. You don not need apply a lot, but after the masque the result is very noticeable: the hair looks soft, and shiny. The masque makes hair look and feel healthy. The scent is divine and it leaves hair luxuriously soft. I have thick, long, wavy hair and it detangles well. I use it after I get my highlights to give my hair some extra TLC. 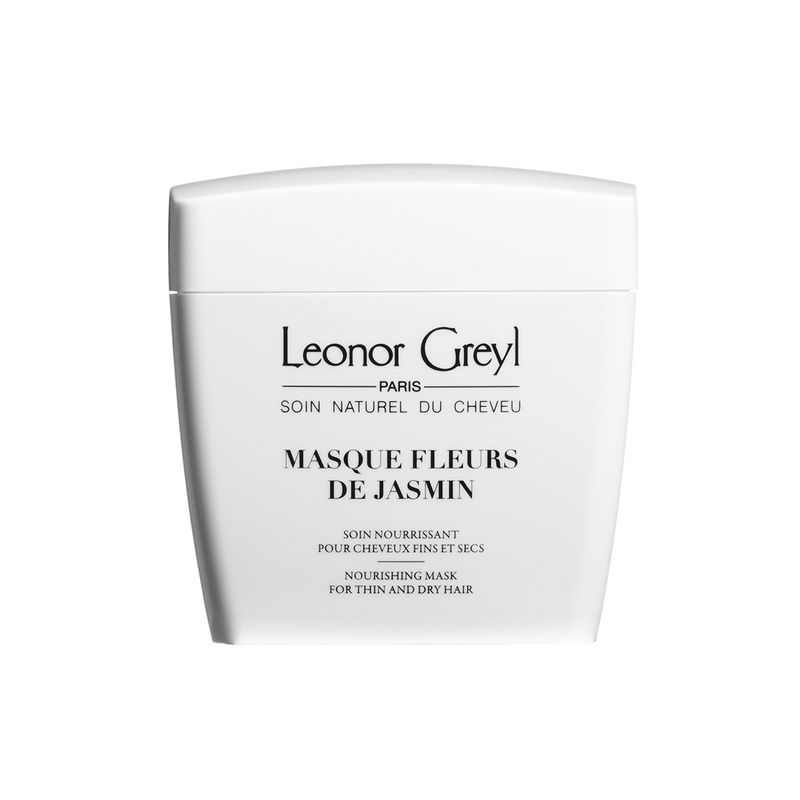 I’m amazed by Leonor Greyl products. They actually sink into your hair and repair it. The Jasmin masque makes my hair so smooth and it feels so strong, even days later. With every other product I’ve tried, it seems like it gives the appearance of healthy hair, but the next day my hair is completely dehydrated. Not with Leonor Greyl! I’m 46 and have been using MFDJ for almost 20 years. I use about 1/2 -1 tsp. every day as a leave-in conditioner after I shampoo and condition my fine, dry, wavy, just-past-my-shoulders hair. In my twenties it was a hardship to pay so much for a hair product, so using it as a leave-in was how I made it last to justify the cost – and it worked so well that I’ve never stopped using it this way. Blowouts look amazing because MFDJ keeps the hair smooth on the brush during so my hair is smooth, soft, and shiny. And the smell is just divine! Love this mask! It actually works great as a daily conditioner on my fine, eastern-european hair. It helps to detangle and leaves my hair soft and smelling great. When using as a mask, I just leave it on longer for a more intense treatment. I use this mask as my daily conditioner. It doesn’t weigh my hair down ad I’m addicted to the soft jasmine scent! I have curly, think hair that is dry and it gets really poofy without any product in it. I have tried countless of products to somewhat help and calm down my hair but nothing has worked as great as this product. I do a masque on my hair maybe once a week and I can tell a huge difference already! This is THE ONLY conditioner that I have found that actually works and does not make my hair a complete mess!! Now that I have tried this I cannot imagine going back to anything else. I ordered this item after reading that Jennifer Anniston uses it…the seller not only sent me the purchased item, but included lots of samples of other items made by the same company. Great stuff!! I want to order more!! I have a lot of hair that’s fine on top and wavy/course underneath. It’s always hard to find something I like and I’ve tried so many salon brands. What works best for me is to use something moisturizing/hydrating to eliminate bulk, waves and frizz but those products, even the pricey ones weigh my hair down too much after a while. I’ve tried many high end brands for volume but for some reason they leave my hair static cling. Needless to say, I change products every so often and just when I think I’ve stuck gold I find myself on the hunt again after a couple of months. Enter this product line, I shampoo everyday using their volumizing shampoo and follow every coupe of days with this conditioner, my hair is the best it’s been in YEARS. I highly recommend giving it a try. My husband loves the smell of this (he doesn’t know how much it costs!) and I do too. I also love how it makes my hair look shiny and feel really light. My hair tends to get dry on the ends and just using this once a week makes a huge difference. I’ve tried a couple of their masques and I like this one best. It has a nice smell and it gives my hair a lot of body, which is great because my hair is really thin. I like to use it every other week and I usually try to leave it on for at least 20 minutes. Masque Fleurs de Jasmin smells like heaven! I love the way it makes my hair feel when I use it. My hair is always shiny, bouncy and beautiful after I style. I have medium length, colored hair and use this with the Leonor Greyl Bain B Vitalisant shampoo. They are perfect together and were recommended by my stylist. I am an an addict now. Designed in 1998, Masque Fleurs de Jasmin was the first mask for fine hair. A veritable revolution thanks to a formula that nourishes hair without weighing it down, it emerged as one of the brand’s iconic products and was awarded a series of prizes, most notably Marie Claire’s prestigious Excellence Award. Infused with the delicate, Moroccan garden inspired scent of jasmine, its creamy texture melts into hair, making it ideal for use as an instant beauty booster or in a more intensive treatment.